This Safari takes you South through the Great Rift Valley to Maasai Mara game reserve where the largest concentration of wildlife in Kenya is to be found. Then back North to the remote lakes Nakuru,Bogoria and Baringo a bird watchers and naturalists paradise. Pick up in the morning and head west for Maasai Mara Game Reserve for luch at the campsite followed by afternoon game drive in the game reserve which is Kenya's finest wildlife sanctuary.Including migrants, well over 450 species of animals have been recorded here. Although July, August and September are the months when the Mara plains are filled with migrating wildebeest and zebra, there is also resident wildlife year round. The famous Maasai tribesmen live within the dispersal area of the game reserve. Dinner and overnight at the Campsite. Full day spent in search of Elephant, Zebra, Wildebeest, Rhino, Buffalo, Lion, Cheetah, Leopard and other plains game. All meals and overnight at the base campsite. 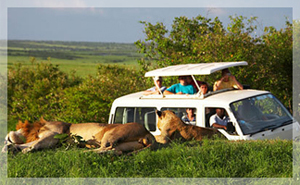 Morning game viewing in the Mara with an optional nature walk or a visit to a nearby Maasai village in the afternoon. Dinner and overnight at the campsite. After breakfast leave the campsite and depart for Nakuru. Lunch is served enroute. Lake Nakuru is renowned for it's large variety of world famous birds. Its possible to see other game such as Rhino, Water Bucks, Impala, Buffalo and Gazelle in the surrounding gardens. Dinner and overnight at a Nakuru budget hotel. Morning spent viewing game at Lake Nakuru and in the afternoon proceed to Lake Baringo. Those who prefer can organise a boat trip to view the many birds which inhabit this lake at extra cost. Dinner and overnight at the campsite. Explore on foot this natural lake and view the Flamingoes in their thousands. Caution must be taken, while walking near the hot springs as these are super hot. Depart for Nairobi in the afternoon via Nakuru. Note: Either Game Viewing or a Tour to the Farm on the third day. Depart from your accommodation in Nairobi after breakfast for a journey along the floor of the Great Rift Valley with a stop over at the View Point to have a glance at the Breathe taking Escarpment with Panoramic View of Mt. Longonot. Lunch enroute, and then enter Maasai Mara in the afternoon to enjoy a game drive before proceeding to the campsite for dinner and overnight stay. Full day will be spent in the vast Maasai Mara in search of its renowned plain game; Black manned Lion, Leopard, Cheetah, and migration of Wild Beast and Zebras. The ride will take you to the famous Mara River where we have the Hippos and Crocodiles. This section also boasts of many species of Bird life. Dinner and overnight at the campsite. Note: You can enjoy Balloon ride very early in the morning at an extra cost US$ 450 with Champagne breakfast or a visit to a Maasai Cultural village at US$20pp or Maasai Guided Nature Walk at US$20 in between. After breakfast leave Maasai Mara for Lake Nakuru National Park. Lunch en route. On arrival proceed for a game drive round Lake Nakuru to view Flamingoes, water buck, buffaloes etc. Lake Nakuru is a bird watchers paradise and over three hundred species of avifauna can be sighted. 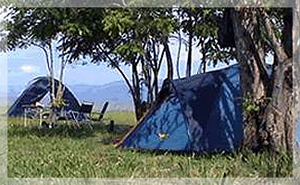 After bird and game viewing continue to Lake Nakuru Guest House for dinner and overnight stay. After breakfast leave for Nairobi, stopping at the Great Rift Valley for a panoramic view, and continue to Amboseli home of the Jumbos. Lunch enroute : Proceed for a game drive in search of cheetah, rhinos, elephants, and also plenty of plains game, with the overview of the Majestic Mount Kilimanjaro in the back ground. Dinner and overnight at a budget Campsite. Proceed for a game drive after breakfast. Lunch at the Campsite. After lunch, a further game drive in search of the Jumbo (Red Big Elephant).Dinner and overnight at Campsite. After breakfast, enjoy an enroute game drive on your way back to Nairobi arriving late in the afternoon to end your tour.